Having healthy teeth and gums will become a whole lot easier for everyone with a new joint venture between two of the leaders in the oral health industry. Toothbrush Direct an online oral health product distributer has decided to join Portmore Dental in an venture to compliment the service provided to clients of both companies alike. Portmore Dental Office one of the best known dental practices in Surrey, has long been the benchmark for providing their patients with the best in oral hygiene care and advice. The dental proffesionals at Portmore, pride themselves on the five-star treatment they provide all their clients who visit the practice. Toothbrush Direct has been hailed as one of the most widely used vehicles for advice on, and provision of, dental healthcare products for the discerned client. They have a vast line of products, serving every oral healthcare need. The joint venture will provide the user with the best of both worlds. Finally there is a better way to get your dental products and dental care advice without having to leave your living room. Both websites will provide the best of oral health advice and the convenience of shopping for your dental healthcare products through clear and easy to navigate links, providing the service a lot of people have been waiting for. For the first time in dental care, it will be proved that Who you buy from can be just as important as What you buy. Toothbrush Direct have today launched their new ecommerce website. It is hoped that the new store will offer a more pleasing layout, a more complete order process, whilst continuing to offer the smooth and simple operation of the previous website. If you have any queries or troubles with the new website please do not hesitate to get in contact with us. 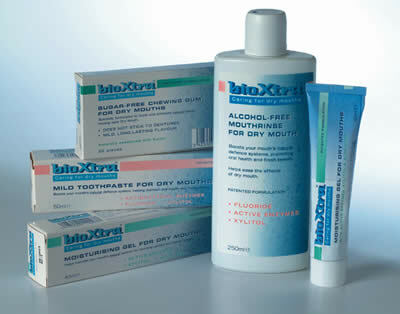 Toothbrush Direct carries one of the most comprehensive ranges of Dry mouth products available such as BioXtra, Saliva Stimulating Tablets and Biotene. All are professionally recommended for the sufferers of Dry Mouth Syndrome either temporary or permanent. Using only Dry Mouth products is recommended for patients who suffer from this condition as products designed for more general use may cause further irritation and allow the discomfort to get worse. Oramoist is available in a Spray and Lozenges the spray is in a pocket sized pack to use at any time, moistens dry mouth instantly. The spray contains both Fluoride and Xylitol to strengthen teeth that may be suffering from a lack of saliva and is alcohol free for gentleness, Mint flavoured. The lozenges can be used at any time, citrus flavoured lozenges are sweetened with sorbitol. Buffered fruit acids are safe for tooth enamel. A new product for sufferers of Dry Mouth Syndrome. This spray comes from Australia contains Phoscal ® which is a source of calcium phosphate necessary for strong teeth added in a unique formulation. It has a pleasant taste and does not give an oily feel in the mouth. It is fluoride free and can be used as often as required. Suitable for anyone suffering from dry mouth either temporary or permanent, however not suitable for anyone suffering from an allergy to dairy products. Products to alleviate the symptoms of Dry Mouth Syndrome either temporary or permanent. Relieves oral dryness, Helps two protects between brushings, Reduces plaque and helps to maintain the enzyme balance thus helping to restore the protection that is normally afforded by a greater saliva flow. Contains enzymes and is particularly useful at night when will give a long lasting moisture. TePe's range of dental equipment was developed with the assistance of the Swedish Dental Hospital. Their toothbrushes have three types of brush head Select, Compact and Nova which all carry a British Dental Health Foundation endorsement. The Select range is available in Medium, Soft and Special Care (extremely soft surgical brush) these are all superb adult toothbrushes with a high quality end rounded bristle. 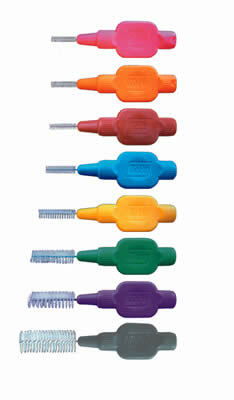 The Compact range is available in Medium, Kid Soft and Special Care (extremely soft surgical brush) ideal for children as the small tapered head is able to access difficult areas. The Nova range is also available in Medium, Soft and Extra Soft. It has a medium sized tapered head with colour coded tip indicating filament texture, with new ergonomic comfortable grip. TePe toothpicks are very slim and flexible plastic picks which makes cleaning easier especially between narrow spaces and back teeth. Particularly useful when on the move and come complete with a pocket size toothpick carrying case.